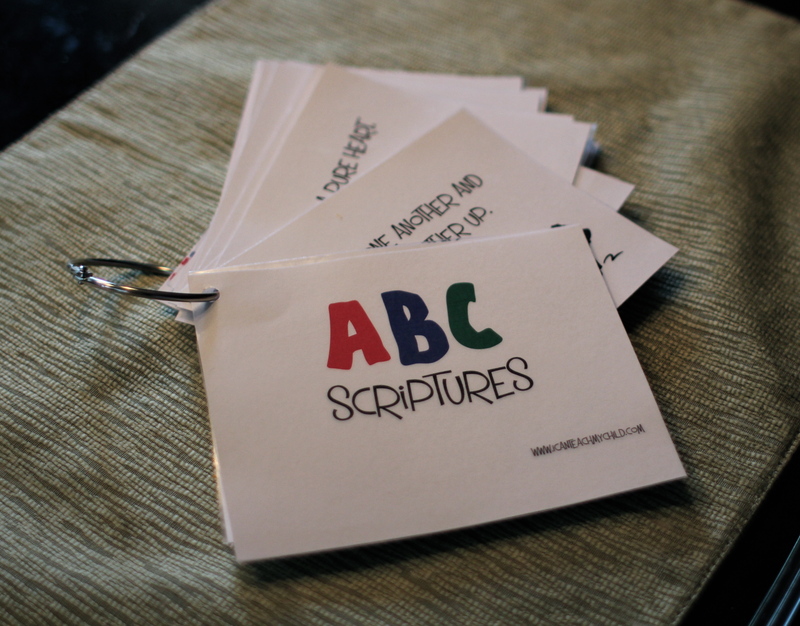 I found ABC’s printable scripture cards on pinterest from this site and had been wanting to make them for Parker for some time now. This past weekend I decided to do it, and sent Dan the info and he had them printed for me. I got some self laminating sheets and laminated myself and punched holes and added a binder ring. We had the ring of scriptures on the dinner table so I could practice with Parker during our meals. Parker doesn’t really “memorize” things (he barely remembers familiar songs) so I was planning on doing a verse a month. I’m working on the alphabet with a friend of mine each week, so I thought this would be a great addition. I was so surprised when he completely had it memorized in just a few days! Wow, what a smart little guy! I’m so proud of him! I’m looking forward to doing the rest of the alphabet with him, and memorizing some great scriptures for myself along the way. Great idea! Parker is smart like his momma! Proud of you!